Today may see you making a difficult decision to let go of a situation that has not been healthy or rewarding for you. The Eight of Cups refers to the realization that you’ve put more into something — invested more of your time, energy, heart, etc. — than you’ve gotten back, and now it’s time to face that reality and walk away. In this version of the card a young woman ascends a staircase that leads to who knows where. She climbs the stairs carefully and determinedly. Behind her — at the base of the stairs — are eight upright chalices, all presumably still full. This is what makes the decision to walk away so agonizing: it’s clear that there’s still something there and that leaving it behind means letting go of the potential for it to grow into something more. Usually the realization that it’s time to walk away comes after you’ve given of yourself to the point of exhaustion. You may have come to this juncture in a relationship, or have gone as far as you can in your career, or have worked on a project that held promise in the beginning but has since become a drain. Whatever the scenario, know that walking away can be tremendously liberating. 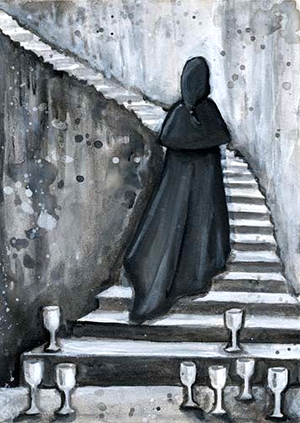 Just like our cloaked woman in the card, you may not know exactly where you’re heading but you do know what you’re leaving behind, and the courage it took to do so is empowering in the end. This card is part of the Phantonwise Tarot series, designed by Erin Morgenstern, author of the NY TImes bestseller The Night Circus. This deck was painted entirely in black and white acrylic and was at one time available through Adam McLean’s fantastic Alchemy Website but is now sold out. Erin does sell limited edition prints through her Etsy storefront.